Hybrid ropes offer high strength while being light weight. As strong and robust as a steel rope but lighter with superior bending fatigue life. A hybrid rope is a steel and fibre combination rope where the fibre is an integral load bearing member. Several years ago, we started the development of a hybrid rope for special hoisting solutions. Driven by the needs of our customers in the mining industry, our innovation and technology teams have focused to create a next generation rope. And they did with our hybrid rope! The hybrid design brings the best of both worlds: the strength and abrasion resistance of steel and the high fatigue performance of fibres in a lightweight construction due to high modulus specific grades. 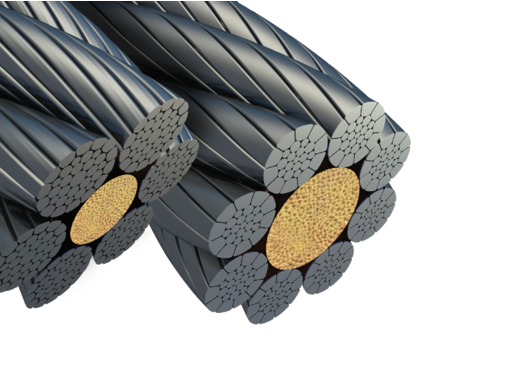 By oﬀering these higher strength, lower weight ropes, we can provide underground mining customers with a competitive and safe edge in their operations, which, according our first calculations, can result in the increase of productivity because of higher payload in each cycle, starting typically with a minimum of 10%. Our first field trials clearly indicated an increased lifetime of the hybrid rope which eventually led to an uptime in operations. To achieve this innovative hybrid rope we worked closely together with a selection of top high modulus fibre producers. Many field trials have been performed over recent years with positive results. Objective: To complete the first hybrid rope field trial involving local mining authorities in the process to verify the detection and discard in a production drum winder application specifically hybrid ropes. Objective: To extend the service life by taking advantage of the load bearing core to increase operating safety factor and to verify the detection and discard in a friction winder application specifically for hybrid ropes. Removed from service after 2 years due to overhaul of the shaft, no visible rope damage during whole period. Total tonnes hoisted 4,721,258 (95% - hoist average is 5,000,000).